I was under the weather last week and was happy when I woke up Saturday morning feeling almost 100% again. I had planned to try out 3 new recipes for our dinner party, but stuck to my mom’s Chocolate Butterscotch Dessert to complete the meal. This was my favourite dessert growing up and it has now become a favourite for my entire family. This dessert is easy to make, quick to prepare and absolutely delicious. Unlike most desserts that can be pricey to prepare, I can generally make this by purchasing only one item ~ whipping cream. This is a real winner! Preheat oven to 400 degrees. Separate the eggs. Beat the whites until very stiff and gradually add the beaten yolks. Add the icing sugar, cocoa and flour. Pour the batter into a greased and floured jelly roll pan (approximately 15 1/2″ X 10 1/2″ pan with 1″ sides). Bake 7 minutes. Remove from the oven and carefully begin rolling the cake lengthwise releasing it as you roll. (The pan won’t be overly hot, so you really don’t need to wait very long before you’ll be able to handle it.) Place the roll on a damp towel and roll the towel around the roll, so that the air can not get at the roll. When cool, unroll the towel and cut the roll into sections for serving. Bake the cake in a jelly roll pan. Roll the cake and place in a damp cloth. Butterscotch Sauce: Place the last four ingredients in a glass bowl. Set the bowl in a hot water bath so that the butter melts. ( You only want to melt the butter, do not boil by placing on direct heat or microwaving for too long.) Stir until all of the melted butter has been thoroughly mixed with the other ingredients. Beat the whipping cream. Add 1/4 cup icing sugar and vanilla, if desired or simply serve as is. Place a dollop on each piece of chocolate roll. 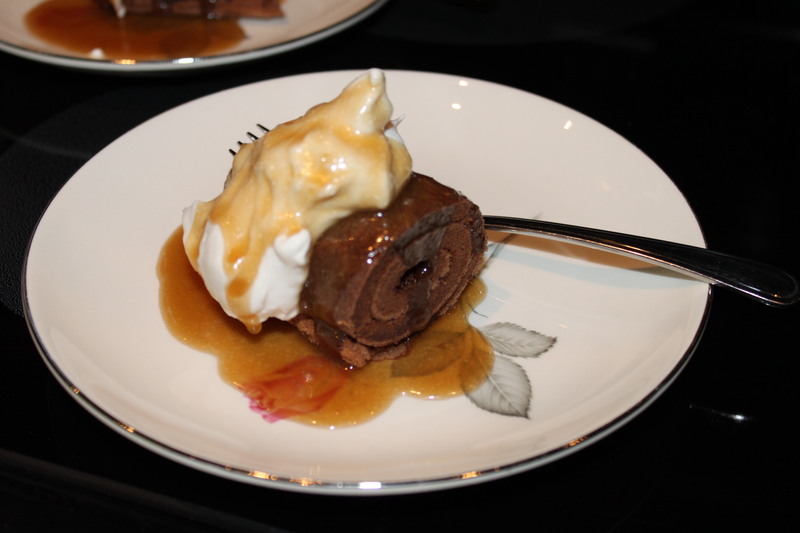 Serve the warm sauce over sections of chocolate roll topped with whipping cream. Enjoy!